Rangefinders have revolutionized the way that amateurs play the game of golf. With the press of a button, the golfer can look through the lens of the rangefinder and immediately know the distance to the pin and yardage to various other areas on the hole, such as bunkers and hazards. Remarkably, the best rangefinders have taken the guesswork out of a weekend round at the local club. Amateurs no longer have to play the exhausting game of looking for the nearest distance marker and then going through the circus of attempting to figure out what the relative yardage is for their upcoming shot. The problem with the guessing game is that amateurs have a difficult time factoring how slope affects the ultimate distance needed on each shot. For example, perhaps a golfer hits their 8-iron 150 yards. So let’s say their second shot is right at the 150-yard marker, but the hole is uphill. When the golfer swings their 8-iron, and it falls short of the green, they may think they miss-hit the club, when in actuality, the golfer did not factor in the slope of the fairway that adds yardage to the needed distance to reach the green. 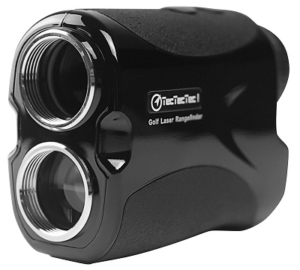 Sophisticated laser golf rangefinders can take all of the doubt and second guessing out of the distance game and provide accurate yardage that allows the golfer to put their fears aside and confidently hit each long distance shot. So what do you need to know before you go looking for the best rangefinder for your game? Well, in this definitive guide to golf rangefinders, we will provide all the answers you’ll need to help you find the right device for helping you make improvements to your game that see your scores drop to all-time lows. Typically, rangefinders utilize a laser to determine distance. This feature goes against something like a GPS device or watch that depends on a satellite for your yardage. Most golfers prefer a laser-guided rangefinder because they are potentially far more accurate than a GPS device. GPS devices do have a technological advantage. As Owen writes, “GPS units are more diverse. 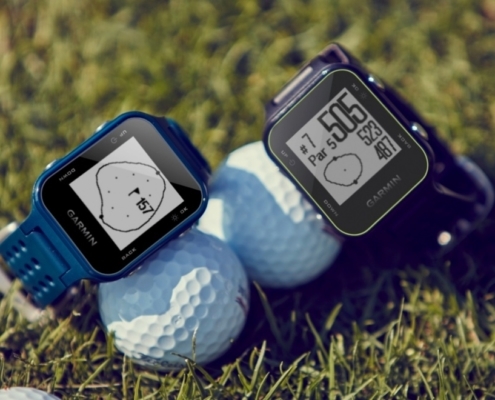 Most popular models also let you do stuff like keeping score for your foursome, tracking your club selection, and measuring your drives.” That said, the main complaint about GPS devices is that their accuracy can stray off the mark by a few yards. Admittedly, laser rangefinders do require a bit of care. You can’t leave them in the trunk of your car or out in freezing weather without it potentially affecting the accuracy of the laser. Same goes for GPS devices and watches as they need an equal level of maintenance and care to keep their effectiveness. If there is a deciding factor in the war between the two devices, advanced golfers greatly prefer laser rangefinders inside 150 yards. The improved accuracy helps gauge the correct distance for a shot into the green. You may not think that it is important, but a birdie putt from 20 feet may have less than a 5% percent chance of going in, whereas the same golfer has a 30% accuracy from 10 feet. Are rangefinders legal in golf? There are exceptions, however, to this rule. The USGA has also declared that rangefinders and other devices can be used and shared by golfers using a “Local Rule” exception. Basically, what this means is that local clubs and courses can lift USGA Rule 14-3 for tournaments allowing players to use distance-measuring devices. Players who use these devices are allowed to share with other players during the tournament. According to the USGA, once the Local Rule is in effect, “you may use any application or device to measure distance, provided you do not use any feature on the device that, if used, would be a breach of Rule 14-3. A golf rangefinder works similarly to a pair of binoculars. Using both hands, the golfer looks through an eyepiece to focus on a specific spot on the fairway or green. Then, the golfer presses a button, and a laser determines the distance to the landmark. Much like binoculars, the golfer must hold the rangefinder steady to lock in the area that the laser will be measuring. Some rangefinders have more detailed features, such as accounting for elevation changes that come in handy when, for example, the golfer hits the ball into an uphill green. If those features are utilized, then the golfer will have to hold onto the laser locating button a tad longer to get a reading. One of the negatives of laser rangefinders, as opposed to a GPS device, is that you need a clear line of sight to measure the distance. So the rangefinder can stumble when trying to use the laser on a dogleg where trees create a barrier. Do you need slope on a rangefinder for golf? If you are using your rangefinder during practice rounds, then a slope feature comes in very handy. The more sophisticated devices factor in the uphill or downhill trajectory of a shot and then factor in the slope for an accurate yardage reading. While you can’t use the slope feature during tournament play, using slope while practicing can really help a golfer determine how elevation change affects their shotmaking. More practice focusing on how different approaches counteract slope will definitely instill confidence during tournament play. 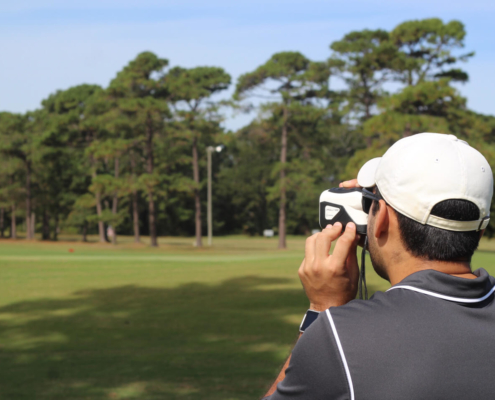 Even if you cannot use rangefinders in tournaments, the device certainly can help with shaving the rough edges off your games to lower your scores. If you are looking for a quick primer on how slope affects shotmaking, we’ve tagged a terrific video by Mark Crossfield that can be found here. Do golf pros use rangefinders? According to GolfWeek Magazine, Before the 2012 season, the PGA officially banned the use of rangefinders during tournament play. However, players are free to use them during their practice and Pro-Am rounds in the days before the tournament officially begins. Most players on tour use the rangefinders during the practice round to find exact yardages from the various landing areas they expect to hit their second shots from during each of the four rounds. By annotating these yardages in their yardage book ahead of the tournament, the golfer can feel confident that they are hitting the right club on each shot. The rule extends to caddies as well. Tour caddies cannot use the rangefinders during a round, or the golfer will be penalized a two-stroke penalty. Any additional rangefinder use violations by the golfer or caddy will result in a disqualification. A reliable and accurate reading from a rangefinder is the device’s primary function. Shoddy rangefinders that give imprecise yardages are pointless to own. When searching for a stable and worthwhile golf distance finder, search for models that will deliver accurate measurements within a yard of the target. Once you purchase a rangefinder, you will need to continually test and make sure that the readings you are receiving are correct. The slope function on a rangefinder helps determine the exact yardage needed for a shot when accounting for the elevation difference from the fairway to the hole. Advanced golfers love having the slope function for shots inside 150 yards due to the precision of the readout. Birdie putts from shorter distances have a higher percentage of going in; therefore, it is wise to have the most accurate information when hitting that second shot. Much like top flight binoculars, good rangefinders have high-quality optical lenses to see through to determine targets and yardage. Top of the line rangefinders has magnification that goes up to 6x. The higher the magnification, the closer it will appear you are to the target. Most rangefinders worth their price will give you a range that stretches well over 1,000 yards and will provide you with a distance to the flag inside roughly 450 yards. Most rangefinders use either rechargeable batteries or batteries that consumers can find in most stores. Rangefinders do not use a large amount of power when doing their readings, so batteries should last over many rounds before they need to be changed or recharged. Scan speed is the time it takes the golf rangefinder to lock into a target. The better the rangefinder, usually the quicker it will find the target due to its increased processing speed. At most, you can expect to hold down the button or trigger of your rangefinder for close to ten seconds for the device to thoroughly scan the target zone. The best golf rangefinders are waterproof, making them completely safe to use in rainy weather. It is vitally important to dry the device between uses in the rain so that the residual water does not remain on the rangefinder. The most popular brand of laser range finders belongs to the Bushnell line of distance-measuring devices. Here is a brief dictionary for their most popular features. You can find their line of outstanding rangefinders here. The fast focus system gives the golfer immediate results without having to slow down play. Bushnell has updated its technology to build rangefinders that can separate background objects quicker, like trees from the flag, for example. 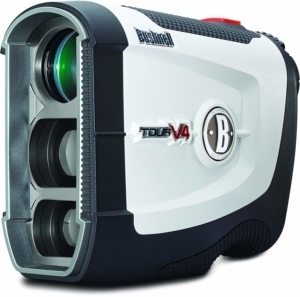 As a result, Bushnell’s rangefinders provide fast focus to lock in yardage for no delays in play. All Bushnell rangefinders have stable grip technology that allows the golfer to hold the device steadier than other similar rangefinders. Using a rigid rubber overlay, the rangefinders from Bushnell are more comfortable to grip and assure the golfer that they won’t drop the device and potentially break it on a harder surface. Bushnell rangefinders have Jolt Technology that focuses onto the target then jolts in your hand when it locks onto a target, like the pin. 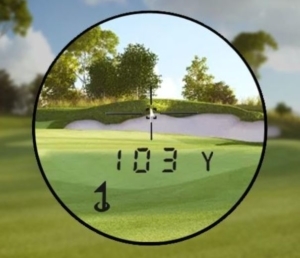 This feature assures the golfer that they have the correct target and distance when measuring their shot. Since slope technology is illegal to use in tournaments, Bushnell has made it easy to disable the slope feature with a simple flip of a switch on the side of the rangefinder. But when you are ready to use the feature during practice play, all you have to do is flip the slope feature back on. Rangefinders are wonderfully affordable devices that are extremely helpful and can provide a considerable boost to your overall goal of lowering your scores. With a host of terrific features, the best golf rangefinders on the market today will create a precise and accurate picture for each shot during your round. If you can stretch your wallet and go for a top-tier rangefinder, you’ll find additional features that could really change the way you see golf. More specifically, the slope feature on rangefinders detects elevation changes to provide accurate adjustments to the shot distance needed to reach the green. Instead of hitting shots off the back of the green or just short of the putting surface, rangefinders can give you a precise distance that allows you to hit the perfect length every time you step to the golf ball.